Open up. Dreams are waiting. They come from around the globe. Bright, bold, and eager — ready to make a difference in the world. They are the students of NYU. And while they represent the diversity that is a hallmark of NYU, there is similarity in their dreams. It begins with the dream of learning in the heart of one of the world’s most inspiring and influential cities, and continues with a desire to invent new ways to meet humanity’s challenges. Sound familiar? 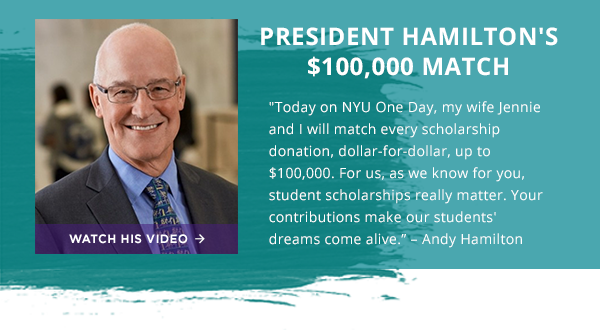 Today, on NYU One Day, we call on our community to join together with President Hamilton in supporting the dreams of every ambitious NYU student. This year, President Hamilton has pledged to match every donation — dollar for dollar — up to $100,000 for scholarships. The bar’s been set pretty high, but we know you’ll rise to the challenge with your own generosity and participation. And we’re just getting started. Help us continue our success from last year with a pledge of support today. Together, we can achieve something bigger than any one of us could alone. 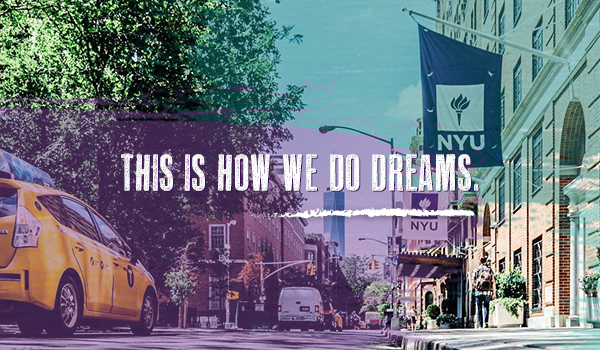 Together, we can help fund countless NYU dreams — dreams that are as diverse and varied as our incredible university. We got this.